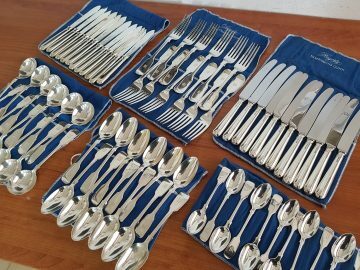 Top notch Silver and Fine Dining at its best in Castle Auctions! 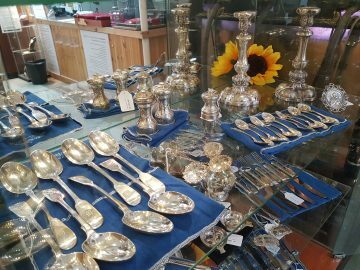 We have a remarkable collection of English Sterling Silver for our next auction, with lovely clear hallmarks and excellent condition; full 12-place cutlery set, further knife and fork sets, serving spoons, tea spoons, salt cellars, pepper mills, picture frames, decanter labels and more… that’s in addition to large Egyptian silver tray and Russian silver jug! 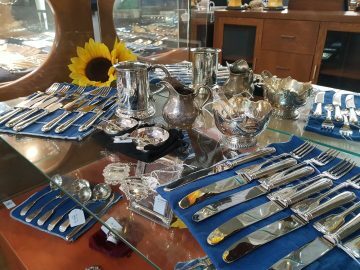 If you are a silver collector, appreciate the finer things in life (or a sound investment in previous metals) then pop along for our viewing days and check out the Silver items going under-the-hammer this Saturday 23rd February. Full catalogue will be online Wednesday evening.